Editor’s note: Jo Becker is the children’s rights advocacy director for Human Rights Watch. Follow her @jobeckerhrw. The views expressed are her own. Every week, “Fumo” risks his life for a bag of rocks. At 13, he began working in a Tanzanian gold mine, climbing deep into unstable shafts that could collapse at any moment. He digs ore and hauls the heavy bags to the surface, where he crushes the ore to powder. To extract the gold, he uses mercury, a toxic substance that could leave him brain damaged. He says he knows it’s dangerous, but has no protective gear. After filling a sack weighing up to 110 pounds, he may end up with less than an ounce of gold. Since 2000, the number of child laborers worldwide has dropped by one-third, from 248 million to 168 million, according to new statistics released by the International Labor Organization. While this progress is encouraging, the number of child laborers is still extraordinarily high. Of the global total, 85 million children, like Fumo, work in hazardous conditions that directly threaten their health and safety. My colleagues and I have interviewed hundreds of children who put their education, their health, and often their lives at risk to help sustain themselves and their families. In India, we met children as young as five making silk thread by dipping their hands into scalding water, leaving their skin raw and blistered. In El Salvador, we found children with gashes on their hands and legs from harvesting sugar cane with machetes and sharp knives. In Morocco, I met young girls like Latifah, who was forced to work 18-hour days as a housemaid, and beaten regularly by her employer. The truth about child labor can be surprising. Although factory conditions have gotten global attention, only a small number of child laborers – 7 percent – work in industry. The vast majority work in the informal sector, primarily agriculture, but also in services – as hotel and restaurant workers, domestic workers and street vendors. The extent of child labor is also jarring. A recent poll of more than 1,000 Americans found that 73 percent guessed that the number of child laborers was less than one million worldwide – a far cry from that 168 million figure. 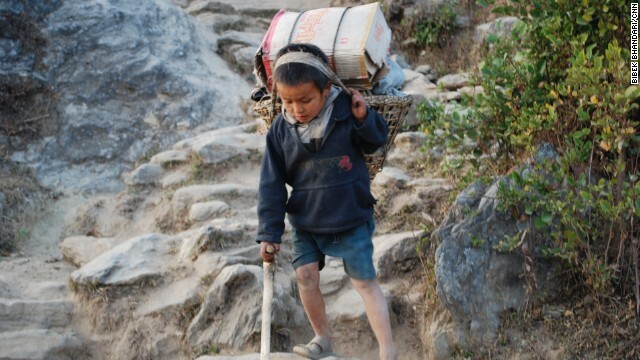 Child labor is not exclusively a problem in developing countries. In the United States, hundreds of thousands of children work as hired laborers to harvest fruits and vegetables, an occupation that is surprisingly dangerous. They risk pesticide poisoning and injuries from working with heavy machinery, and suffer fatalities at more than four times the rate of children working in other jobs. Despite the dangers, loopholes in U.S. law allow child farmworkers on commercial farms to work at younger ages and longer hours than other working children. Governments and other representatives from at least 129 countries are gathering in Brazil on Tuesday to assess their progress in addressing child labor. In 2006, they embraced a lofty goal of eliminating the worst forms of child labor by 2016. That target is sadly out of reach. If current trends continue, by 2016 at least 65 million children will still be working in hazardous conditions. However, the last decade has taught us a lot about what works. The countries that have made progress in reducing child labor have pursued several strategies. They have improved monitoring and enforcement of child labor laws, including imposing substantial penalties against exploitative employers. They have expanded educational opportunities – as governments have invested more in schools, removed financial barriers such as school fees, and added incentives such as school meals, enrollment rates have gone up while the incidence of child labor has gone down. And some countries have used cash transfers to cushion poor families from the financial desperation that often drives them to send their children to work. The stipends offset children’s lost wages and are often conditioned on children’s attendance in school. Child labor is not an unsolvable problem. It’s remarkable that child labor rates fell the fastest in the four years following the global economic crisis of 2008-2009. Now that we have a better idea of what works, we need to buckle down and apply these lessons. Seventy-eight million fewer children in child labor today compared with 12 years ago is significant progress. But 168 million is still far too many. Child labor should not be legal anywhere and that's all there is to it. Unfortunately, as long as there is greed, it will be around. USA is the moral compass of the world! What fuels this is poverty. So long as parents and adults are poor they have no option but have all hands on deck to feed including those of children. We need to attack the economic fundamentals that promote poverty as it is at the heart of preserving and projecting child labour and slavery. Our failure to put an end to such atrocities clearly proves we have much to be ashamed of as a human race. It's outrageous that children in some parts of the world work like in the old days of Charles Dickens. They ply their trades under dirty, dangerous conditions. Refugee children from Syria have to work to support their families. Before the war, they went to school. On the other hand j. von hettlingen, there wouldn't be a civil in Syria today had the West not supported the riff raft trying to overthrow the Assad regime. The longer this obscene support goes on, the worse it will get for the Syrian people on the whole! Bangladesh have over million child labors. They are born into extreme poverty. let's buy products with child labor monitoring programs like GoodWeave! if you Believe the Bible is true then you need to believe in the Church who passed down the Oral tradition for over 300 years AD and wrote the Bible should also be true . Without the Catholic Church you would have NO Bible .